Just add water and each package yields one mug of delicious vanilla chai. 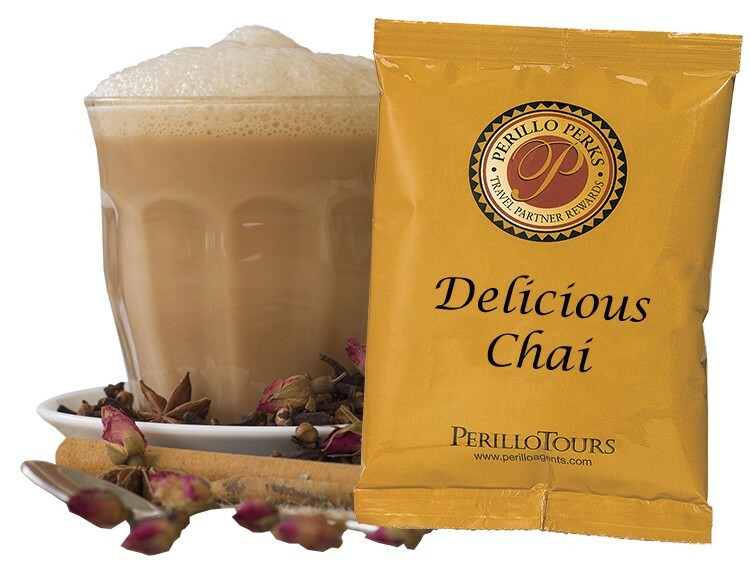 A soothing blend of honey, tea, vanilla, steamed milk and exotic spices. Great for complex graphics - printing directly on front and rear wrapper. Printing from 1 color to 4 color process. Price below for 4 color process. Perfect for fall, autumn, individual apple cider, logo, corporate gifts, single serving, corporate gift, client gift, mug stuffer, halloween, golf, marketing tie-ins, tradeshow giveaways, instant chai mix, spiced chai or chai mix. For quantities over 10,000 pieces, please submit artwork to confirm above pricing. Above prices are based upon flexographic printing. Some artwork cannot be printed flexographically and must be printed digitally. Digital printing would increase the above price. Call for rush service. Over-runs: +/- 10%. Prices below includes 4CP printing.